Home November 1 2015 Vol. 35 No. 19 Feature Articles Cell-Line Optimization: Nature or Nurture? Cell-Line Optimization: Nature or Nurture? Are Great Cell Lines Born or Made? Both! Has nature or nurture been more responsible for the huge improvements in biopharma manufacturing productivity over the last quarter century? The traditional response is nurture, specifically media and feed strategies. Dr. Freeman believes that in the future, genome engineering of CHO cells will bring about substantial improvements in what cells are capable of, and not just facilitate selection of high producers. Genetic manipulations, for example, could reduce the bioreactor run time needed to generate the requisite amount of product. Quality considerations will also guide the targets of genetic editing, and these might improve expression of novel molecule architectures that CHO cells may have difficulty expressing and folding efficiently. The second approach involves customized solutions. It would be the preferred approach if every difficult-to-express protein happened to present unique challenges. To enhance the ability to work on a case-by-case basis, Horizon is developing reporter systems to be used in conjunction with CRISPR/Cas9 screening. Historically, cell-line performance has been enhanced through media, feed, and process optimization, primarily by fine-tuning these factors toward high growth and productivity. However, omics, CHO genome sequencing, and enhancements in genome editing have enabled scientists to take a more direct route in cell-line optimization through the modification of specific genes that directly affect cell culture performance or protein quality. “Genes that could be targeted include those that may be involved in cell-cycle regulation, cellular metabolism, cellular transcription and translation, the secretory pathway and protein glycosylation, or other post-translational modifications,” says Trissa Borgschulte, Ph.D., principal R&D scientist, cell-line engineering, SAFC, Sigma-Aldrich. Dr. Borgschulte believes that media and feed optimization, as well as cell-line engineering, will continue to be major avenues for cell-line optimization. “Cell-line engineering,” she holds, “will continue to increase as our knowledge of the CHO genome and CHO cell biology grows. Several applications of genome editing are generating attention. These include site-specific integration of transgenes into transcriptionally active and stable genetic loci, and genome modifications to simplify the purification and downstream processing of recombinant proteins. Simultaneously, advances in media and feed strategies, including principal component analysis, have helped identify raw materials that contribute to cell-line performance and/or protein quality, and those that do not, thereby helping to streamline formulations. On the question of nature vs. nurture, Gene Lee, Ph.D., director and U.S. head of protein and cell sciences at EMD Serono, believes that future improvements will be based to a significant degree on cell-line engineering. He anticipates that advances in next-generation sequencing/deep sequencing, CRISPR/Cas9 systems, zinc finger nucleases, and transcription activator-like effector nucleases, coupled with techniques for mining the CHO genome, will provide scientists with a number of possibilities for engineering CHO and other industrially relevant mammalian hosts to advance molecules from research into development and manufacturing. In this image, an SAFC scientist is contributing to the development of a cell line by identifying clones that express high levels of protein. Once high-performing clones are identified, they are returned to clients for use in biomanufacturing. Cell-line engineering advances may emerge from collaborations between life sciences companies and academic researchers. For example, Lonza has entered collaborations with David James, Ph.D., a professor at Sheffield University, and Mark Smales, Ph.D., a professor at University of Kent. These researchers are using bioinformatics to understand protein and gene expression differences between high- and low-producing cell lines. Lonza has tried a number of cell-line engineering approaches over the years based on inhibiting apoptosis, for example, by overexpressing the Bcl2 gene. Another strategy involved overexpressing chaperone proteins or other proteins identified through omics studies as being critical for antibody expression. But according to Dr. Racher, these approaches failed to provide significant improvement compared with standard cell lines. Gene engineering, however, may prove to be more useful as knowledge accrues in various areas: gene networks, which proteins are being expressed in the cells, and how protein profiles relate to mRNA levels. In time, that knowledge should lead to engineered cell lines with improved productivities. But the most significant improvements, Dr. Racher asserts, will be in addressing the critical quality attributes of antibodies and non-antibody proteins. In particular, he mentions blood clotting factors that excel at gamma carboxylation. These factors are conventionally manufactured in BHK cells. With titers for some antibodies rising 100-fold or more in recent years, the industry increasingly considers cell-line improvements to address quality rather than quantity. “Where gene engineering will be most important is the types of products you can make, for example, fucose-free antibodies,” Dr. Racher tells GEN. But when products undergo fine-tuning for levels or ratios of, say, sugars such as fucose and galactose, or levels of sialic acid, the process, media, and feed will continue to be the most important factors. A lot of the cell optimization buzz of late has started following transient expression systems that are efficient and capable of producing sufficient quantities of protein to enable early-stage development work. The cell-optimization angle here is that traditionally such systems employed HEK293 human cells. Transiently transfected HEK293 human cells tend to produce significantly higher titers than transiently tranfected CHO cells. Human and CHO systems, however, differ significantly with respect to glycosylation and other post-translational modifications. These systems, then, may occasion a huge leap of faith if one is used during discovery and another is used during bioproduction. “Obviously, a system that is both high-producing and works in CHO would allow developers to begin their work in CHO and end in CHO, from discovery to bioproduction” says Jonathan Zmuda, Ph.D., an associate director of cell biology in the Life Sciences Solutions Group at Thermo Fisher Scientific. 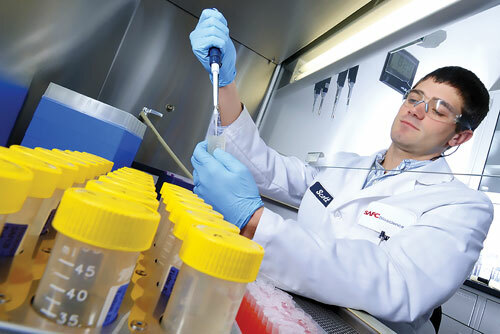 Thermo Fisher provides the Gibco ExpiCHO Expression System, which facilitates the transient expression of proteins in CHO cells, achieving protein yields of up to 3 g/L, thus allowing developers to evaluate early-stage drug candidates more completely, in the same cell type as their eventual production platform. ExpiCHO speeds developmental timelines by eliminating the need for different cell types for transient versus stable expression, thus also reducing a key quality risk during the transition from research into development. Thermo Fisher considered two approaches when developing ExpiCHO. The first involved modifying the CHO genome specifically to enhance expression. The alternative was to select high-producing clones from the company’s existing cell banks. The latter strategy was superior in terms of both protein yields and protocol simplicity. Engineering cells has several drawbacks from the perspective of transient expression. Aside from having to spend time engineering and characterizing the cells, developers must be sure that the cells maintain the engineered construct, a task that typically involves the cumbersome utilization of selection antibiotics that can inhibit cell transfection. In addition, it is presumed that at some point, cells will max out their ability to generate properly processed proteins. “You must demonstrate that engineering efforts to improve yield do not adversely affect quality,” Dr. Zmuda insists. Finally, optimization efforts with engineered cells, unlike those with naturally selected cells, tend to run afoul of intellectual property issues. Such issues abound in the world of engineered CHO expression cells. “You can’t take a bad clone in a bad culture system and make it good through genetic engineering,” Dr. Zmuda explains. Thermo Fisher instead exploited the great diversity already present in its cell lines and “optimized” through careful selection, screening, and application of media, feeding, and process monitoring. The ExpiCHO Expression System consists of the following components: the high-expressing ExpiCHO-S cell line; a chemically defined, animal-origin–free culture medium; an optimized culture feed and expression enhancer; and a high-efficiency transfection reagent. According to Dr. Zmuda, these components provide titers that exceed existing CHO transient expression by as much as 160-fold to multiple g/L levels previously seen only in stable CHO cells in bioreactor settings.